20 September 2017, Bangkok and Kuala Lumpur: The Asia-Pacific Network of People living with HIV (APN+) joins the Positive Malaysian Treatment Access and Advocacy Group (MTAAG) in welcoming the approval of a government use license (also known as compulsory license or CL) in Malaysia for sofosbuvir, a key directly acting anti-viral (DAA) that is very effective in the treatment of hepatitis C.
This morning the Hon’ble Minister of Health of Malaysia, Dr. S. Subramaniam confirmed the issuance of the government use license, stating that, “Currently, there are approximately 500,000 patients in Malaysia who are infected with Hepatitis C and it is estimated that 2,000 new cases are reported everyyear. To make matters worse, the cost of treatment for Hepatitis C is exorbitantly expensive and making it less accessible to the patients. As Hepatitis C has become a major public health concern in Malaysia, it is crucial to increase access to its treatment for the benefit of the nation. Therefore, the Cabinet has approved the use of Rights of Government under Patent Act 1983 (Act 291) by exploiting the patented invention of Sofosbuvir tablet 400mg. The last time Malaysia instigated the Rights of Government was in 2003 for anti-retroviral drugs (treatment for HIV infection). 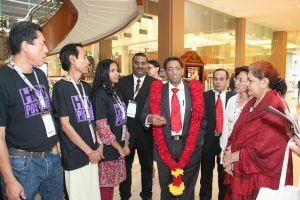 This sets Malaysia to be the first country to initiate such move in the world.” The Malaysian CL ends Gilead’s dangerous games with the lives of people living with Hepatitis C in Malaysia. Gilead excluded Malaysia from its voluntary licenses on sofosbuvir in 2014 and entered protracted price negotiations with the government and reportedly refused to agree to any amount below USD 12000 for a 12 week course of treatment (generic prices are close to USD 300). The negotiated price remained out of reach for the majority of Malaysians and beyond the capacity of the health budget of the country. In a final desperate attempt to checkmate the Malaysian government’s compulsory license decision, Gilead recently announced that it was expanding its voluntary license to cover Malaysia after the government decision on the CL was taken.This did not deter the Malaysian government – with this action, they have now freed sofosbuvir from the exclusive control of Gilead. The Gilead voluntary license includes a high royalty rate and a limited number of companies that can supply generic sofosbuvir to Malaysia. “This is a big step forward for universal access to safe, effective and affordable generic Hepatitis C treatment in Malaysia. Gilead’s unethical pricing and licensing practices have denied Malaysian patients access to this life saving treatment for years,” said Shiba Phurailatpam of the Asia Pacific Network of People living with HIV (APN+). “The Malaysian CL on sofosbuvir shows the importance of the use of TRIPS flexibilities to ensure both access and promote R&D in new medicines. We congratulate the Malaysian government and the Ministry of Health in taking thisnecessary step.” As noted by the WTO secretariat, a compulsory licenseis a flexibility in the TRIPS Agreement and is not the same as tearing up a patent as the patent holder still has rights including to remuneration. Phurailatpam also congratulated MTAAG, Malaysian AIDS Council, Third World Network and DNDi in their untiring efforts to secure affordable treatment for Hepatitis C. “Community based groups have always played a critical role in the use of TRIPS flexibilities by developing country governments and this is the case in Malaysia as well. The leadership, hard work and technical expertise of local civil society groups in Malaysia is particularly commendable in this case, coming at a time when civil society everywhere is facing a severe funding crisis. Their work should be recognised and supported by the government and international agencies,” he said. “We hope that other developing countries will follow the example set by Malaysia and take all necessary steps to secure unrestricted, universal access to affordable generic HepC treatment. Countries should ensure that unjustified patents are not granted on these DAAs and where patents are granted, compulsory licenses will be essential in addressing the global HepC epidemic in order to overcome high prices or voluntary license restrictions,” added Phurailatpam. Statement of Minister of Health, Malaysia: Press Statement Minister of Health, 20th September 2017 – Implementation of the Rights of Government for Sofosbuvir Tablet to Increase Access for Hepatitis C Treatment in Malaysia.